The XIII Tallinn Design Festival will be held from 10 to 16 September 2018. For a week, the unique festival which centres on different parts of Tallinn will be revived - the historic Baltic Station Departure Pavilion, the new building of EAA, Museum of Architecte, Architectural and Design Gallery, Viru Centre, Telliskivi, Alexela Concert Hall, Solaris, Kadriorg Tennis Hall and dozens of satellites in various locations. The theme of this year's major design event is Human Cities. Designers, architects, urbanists, and planners are committed to ensuring a more sustainable and human-friendly urban environment. 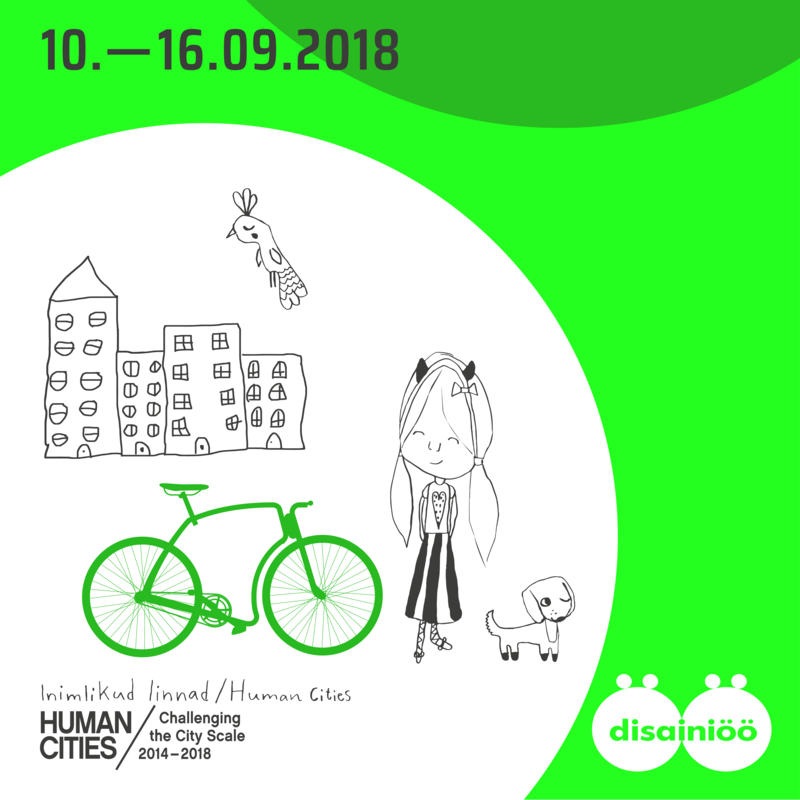 Insights and testimonials from other cities can be seen at exhibitions and the conference which mark the successful end of the four-year Europe-wide project "Human Cities - Challenging the City Scale". We look forward to presenters from several architectural bureaus and other distinguished visionaries such as Mark Kingwell (Canada), Liam Young (UK) and Chantal Vanoeteren (Belgium). Those interested in urban development can see projects from 11 different countries, including innovative projects of Polytechnic University of Milan and Aalto University. The Estonian team will present the relaxation capsule HÄLO. The works of the nominees of Germany's renowned design award IF will complement the exhibition from the perspective of the students. „Human Cities“, a music piece by Villu Veski and Laura will bring the project to an upstanding end. This year's design festival will be spiced by an exciting opportunity to get acquainted with the finest Estonian design in Viru Centre. At the festive Design Award gala product design awards BRUNO and SÄSI, graphic design award and prizes in other categories will be awarded. A graphic designers exhibition „Dialogue“ will also be displayed. Throughout September in the Museum of Estonian Architecture visitors can become acquainted with the exciting history of Isokon which has accrued from the foreign representation of the Luther factory. The text and pictures of the Isokon Gallery in London are supplemented by product examples from the Luther factory and its descendant, as well as replicas of the Isokon products, supported by the well-known designers from Bauhaus - Walter Gropius, Marcel Breuer, etc. The exhibition reflecting the plywood industry is brought to the present day by the examples of the plywood manufacturer's workshop. The topic is complemented by lectures of Jüri Kermik, John Allan and Magnus Englund (Director of the Isokon Gallery Trust). From Hungary, examples of wearable technologies and achievements of digital handicrafts are brought to the Design Festival. Authors are looking for answers on how a traditional craft can continue in today's digital world without losing value. At the exhibitions of design schools one can examine the developments taken place in different educational institutions during the year, also get acquainted with the student works from Lahti and participate in an experience room Design For All. The festival's attractions are fashion shows, PechaKucha and Design Street. The light installations show the way to the attractive centres of the Festival, a musician Kristjan Kannukene presents his new single in the tunnel. It is possible to participate at an unconventional tour „Closed Rooms“ and visit places full of surprises you could possibly not get into. There will be plenty of events for the entire family, including educational workshops for children and workshops "Child Culture Design”.